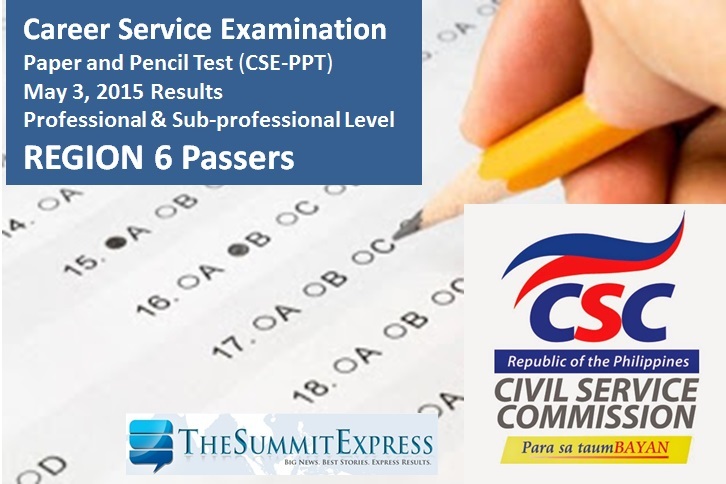 MANILA, Philippines - The Civil Service Commission(CSC) officially released the complete results of May 2015 Career Service Exam- Paper and Pencil Test (CSE-PPT) on Friday, June 12 and June 15, 2015. The list of passers for Professional and Sub-professional level for Region 6 (Western Visayas) is now available on this webpage. The CSC named a total of 1,018 passers for Professional level and 187 for the sub-professional level. CSC said that 180,680 registered examinees took the professional and sub-professional levels on May 3, 2015. Region 6 is among the testing centers with considerable turnout of examinees, 11,993 for professional and sub-professional level.